Set in the National Centre for Scientific Research (NCSR) “Demokritos”, division of Microelectronics (IMEL) in Athens, Greece and led by Androula Nassiopoulou, the group of nanostructures for nanoelectronics, photonics and sensors (Nano 4NPS) investigates semiconductor and metal nanostructures and their applications in electronic, photonic and sensor devices and systems. 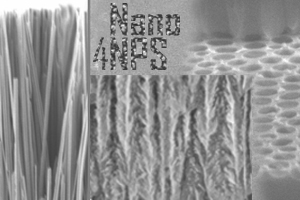 Materials include Si nanocrystals, Si nanowires and other confined systems, as well as nanocrystal superlattices and porous materials by electrochemistry (porous Si, self-assembled porous anodic alumina). Research in the above field spans from material development to device and system fabrication, characterization and testing. Electronic applications include memory and RF passive devices. Currently, the group focuses on the development of a local substrate material on Si, using porous Si, for the on-chip integration of RF passive devices. The application of thick porous Si layers on the wafer for thermal isolation from the Si substrate is also investigated for application in thermal sensors and microcooling devices. Sensors include flow and gas sensors for medical, automotive, and environmental applications.